India’s urban population has grown rapidly over the last century from 25 million in 1901 to 377 million in 2011. The urbanization process, however, has failed to meet the demands of this increasing population, resulting in large gaps in the provisioning of basic amenities to the urban poor, including the people who move to cities as migrants in search of livelihood. Largest section of the urban poor are engaged in informal sector activities where there is a constant threat of eviction, confiscation of goods and almost non-existent social security cover. In this context, Nidan and our Bihar & Jharkhand Regional Office, in collaboration with European Union and Nagar Vikas Samiti, Bihar Legislative Council, organized a workshop on Inclusive City for Urban Poor for Protecting Livelihood, Housing Shelter and Social Security on February 28 at the meeting hall of Bihar Legislative Council in Patna, Bihar. 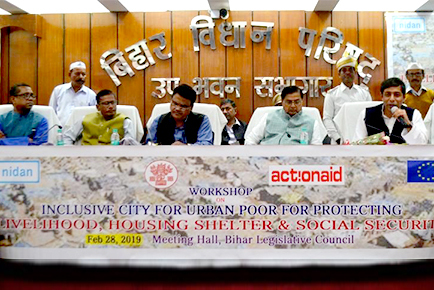 The main objective of this meeting was to discuss the status of and accessibility to basic amenities, such as homeless shelters, housing, safe drinking water, sanitation, basic health facilities, education, decent and secure livelihoods, and social security for urban poor communities in Bihar. These communities largely comprise construction workers, domestic workers, street vendors, other informal sector workers and especially the homeless. An update on the project being implemented by our Bihar & Jharkhand Regional Office with Labour Resources Department, Government of Bihar, to provide support services to migrant workers, was also shared at the meeting. Under this intervention, Worker Facilitation Centres set up in source areas and Migration Support Centres at destination sites are working in coordination towards making labour migration more secure, and in ensuring due rights, entitlements and a life of dignity to migrant workers. As a result of this intervention, 15 migrant bonded labourers from Fatehpur block of Gaya district who had been released were also recently provided rehabilitation support by Labour Resources Department. The workshop was inaugurated by Shri Md. Haroon Rashid, the Honourable Chairman, Bihar Legislative Council, who expressed solidarity with the urban poor and spoke about the need to bring all marginalized communities in the mainstream. Shri Rashid assured that the Government of Bihar was committed towards ensuring all basic amenities to the urban poor. Sandeep Chachra, Executive Director, ActionAid Association India, spoke about the scenario of unplanned urbanization in the country, including in Bihar, which is leading to urban poor communities remaining deprived of their basic rights and entitlements. He urged the Government of Bihar and the civil society in the state to synergize developmental processes in order to make cities inclusive, just and equitable. More than 400 people including several government officials, social activists and representatives from labour organizations, social movements and civil society organizations attended the workshop.